The following is reprinted from Hocus Pocus, Travels With Trump, with permission from the author, Bob Ingram. The cartoon was created by Donald Day. A balmy summer afternoon at the American Cemetery outside of Maastricht in the Netherlands, there is a quiet reverence for the 8,301 American servicemen buried there. They gave their lives to liberate this country. I go down the list of the dead on the mourning wall and two have my last name — an enlisted man and an officer. That is apropos. This is hallowed ground, the neat rows of white crosses standing in solitary salute to these brave, final sacrifices. I feel deep and lasting pride and sorrow. Fifty miles outside Paris is another American Cemetery and the President of the United States chose not to go there to honor our war dead because it was raining. He sent instead his chief of staff, John Kelly, a former Marine general. If Kelly didn’t feel deep and abiding disgust, he is a traitor to all the Marine Corps holds sacred. The President’s reason for his journey to Paris was to commemorate the hundredth anniversary of the end of the First World War. Yet he wouldn’t bestir himself to honor anyone but himself. He was glaringly absent when the other heads of state gathered there and strode down the Champ Elysses in a poignant show of solidarity. Our President’s solidarity is only for himself. He and his shameless wife slunk in later, the President’s red necktie a beacon of disrespect and stupid ignorance. Trump in Paris was an insult to freedom and America. It was despicable and totally in character. Yet it wasn’t as totally stunning as the President’s decision on Monday not to attend Veterans Day services at Arlington National Cemetery. He could have literally walked from the White House to Arlington, but he chose to watch television all day. He is the first President in memory not to go to Arlington on Veterans Day. This is the draft-dodging coward of a President who thinks nothing of using the United States Army as a campaign prop, sending 5,000 troops to the Mexican border to guard against an “invasion” by a caravan of mostly women and children seeking political refuge. The U.S. Army has become red meat for the Trump base. Trump’s presidency is shrinking before our eyes. The mid-term election was a referendum on him and he lost decisively. He hides when he should be handling the ceremonial aspects of his job; as usual, he sends someone — John Kelly — to do the dirty work of firing Jeff Sessions. And as the presidency shrinks, the lies come thicker and faster, a blizzard of prevarication. A month ago, he was all rosy in praising Matthew Whitaker, who became his choice for interim Attorney General. Now that the backlash is in full swing, he’s saying he never even knew the dude, hanging another loyalist out to dry in the hard capitol wind. Still, the presidency could shrink to a micro dot before the Trump base realizes that this sucker cares about as much for them as he does for the crushed Diet Coke cans he leaves in his weak wake. 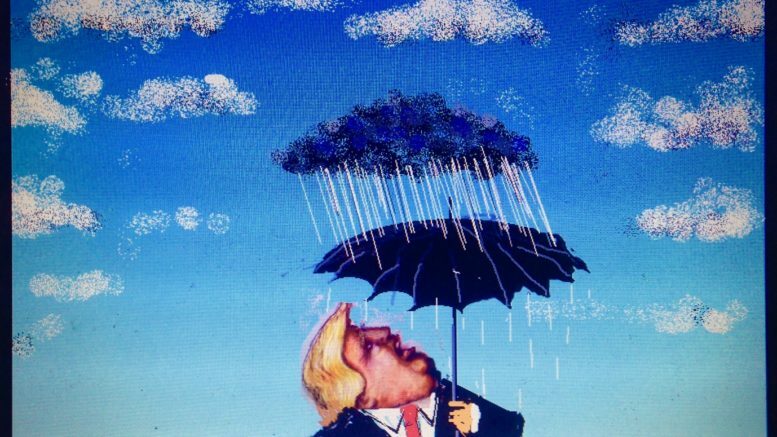 If he won’t go out in the rain to honor American dead, the living should shun him like the plague he is.